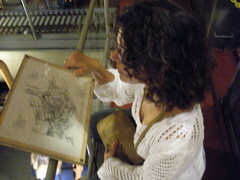 My muse has a mechanical engineering degree. She loves machines. Big ones. She actually worked for a while in a truck engine factory, and can usually tell you an engine’s manufacturer by listening to it run. 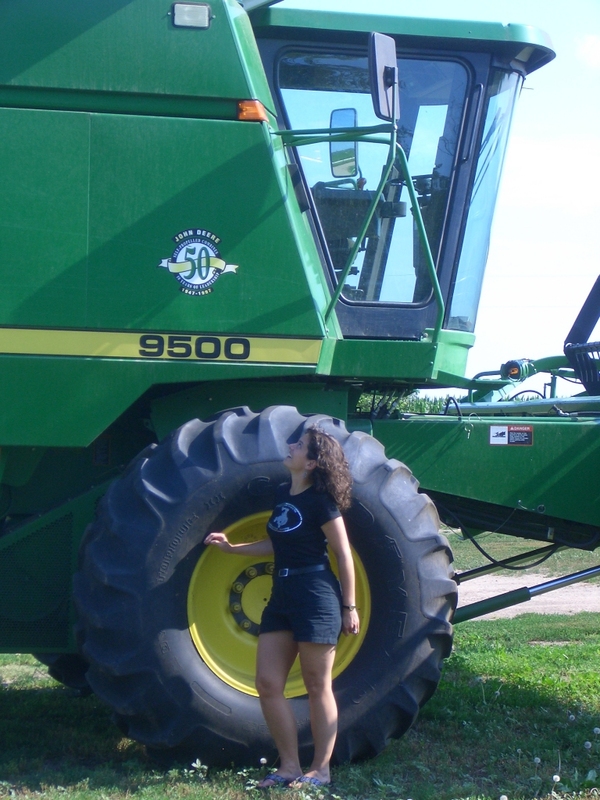 Here she is flirting with a combine the size of a house. So today I’ve got a surprise for her. 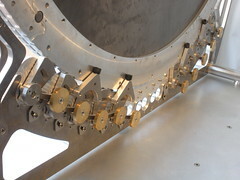 The Long Now Foundation has invited us to an event called MechaniCrawl. 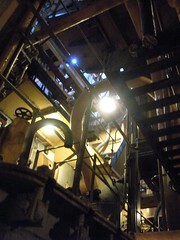 It’s a tour along the North shore of San Francisco of, well, machines. 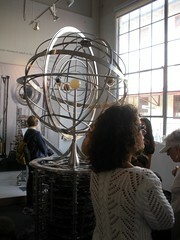 First stop is the Long Now office. If you think this looks like an interesting place, I think you’re right. 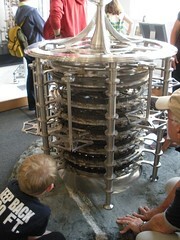 One of their main projects is a clock designed to run accurately for ten thousand years. 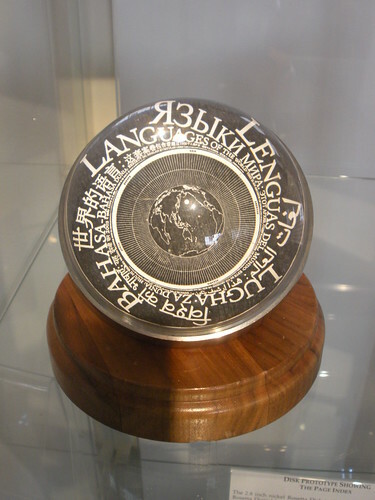 The Rosetta Disc is a few inches in diameter, and stores writing in over a thousand languages, with no electronics. The messages (all 15,000 pages of them) are visibly etched into the surface of the disc. The spiral words around the edge provide a clever hint to some future person who might find the disc. As the letters get smaller, you need stronger magnification to read them. At 1,000-to-1 magnification, you can read the whole thing. The disc is expensive enough that I probably won’t ever own one, but I really like it. 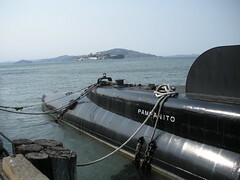 The next place I take her is the USS Pampanito. 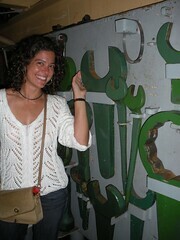 It’s a submarine which managed to survive World War II, where so many others did not. 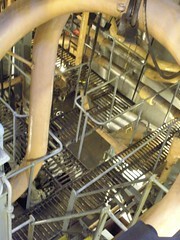 The machinery is amazing, especially the all-mechanical control systems. 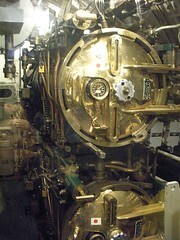 It looks like 20 people would feel pretty cramped in here, but the crew size was 80. Next is the real reason we came. 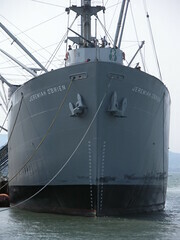 The SS Jeremiah O’Brien is open, the crew is on board, and the engine is running. 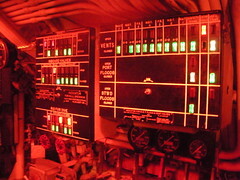 This 1943 ship is still fully operational. 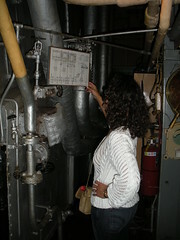 Brunette likes big engines. Smart boy likes brunette. Now you see. I name this wrench Excalibur. 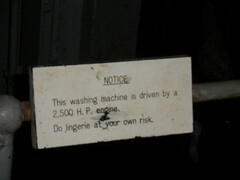 If it’s moving, don’t touch it. The crew is great fun to talk to. The only challenge is the temperature. 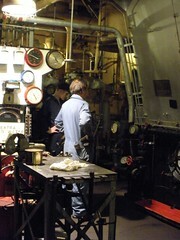 The engine room has us both overheating, but we’re having a great time. 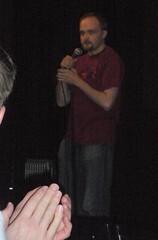 At night, Jeff is headlining a show called Cross Platform Comedy, specifically filled with geek jokes and a geek audience. My muse and I park on a couch and try not to pass out from laughing. We made it, but just barely. 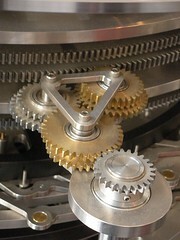 Random assertion: The more elegant a machine’s design, the longer it will run.